The Ovals Design Collection are often chosen as the plastic plates for weddings, anniversaries and fundraisers because of the classic design and high level of sophistication. They're gold plastic plates that you don't have to wash when the party is over. You just toss them in the trash and you're done. You can continue to enjoy the party and just go home and collapse after the festivities. There's no dishes to do and they don't break when dropped by a clumsy party goer. Ovals Design 10.25" Ivory w/Gold Oval Border Banquet Plastic Plates 10ct. Ovals Design 7.5" Ivory w/ Gold Oval Border Dessert/Salad Plastic Plates 10ct. 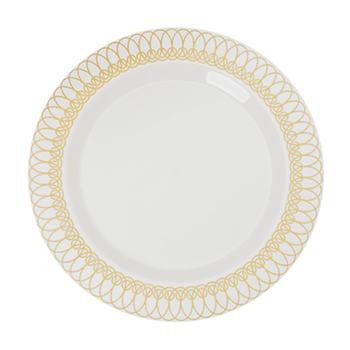 Ovals Design Ivory w/ Gold Oval Border 14oz. Plastic Soup Bowls 10ct.